The purpose for hiring an Accounts Receivable Clerk is to ensure that the company’s payment, transactions are recorded accordingly. 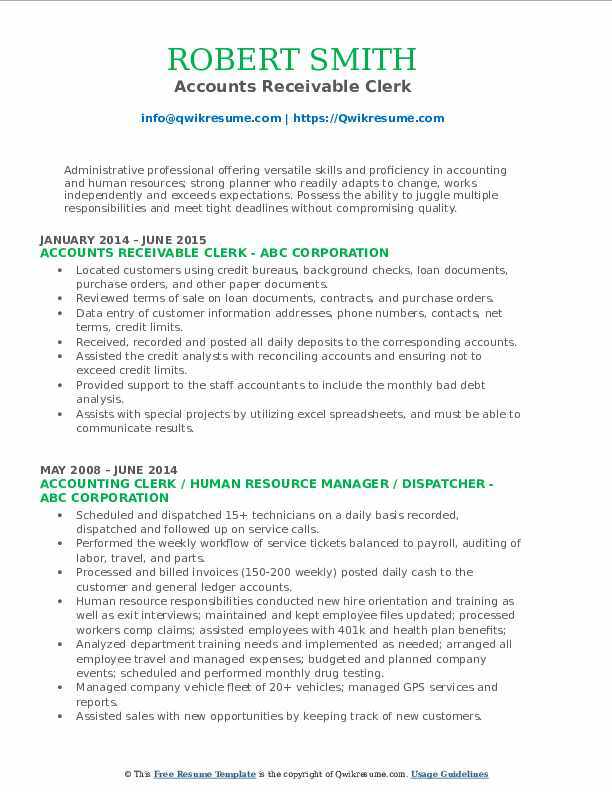 The job description includes securing revenue by posting and verifying receipts and resolving discrepancies. 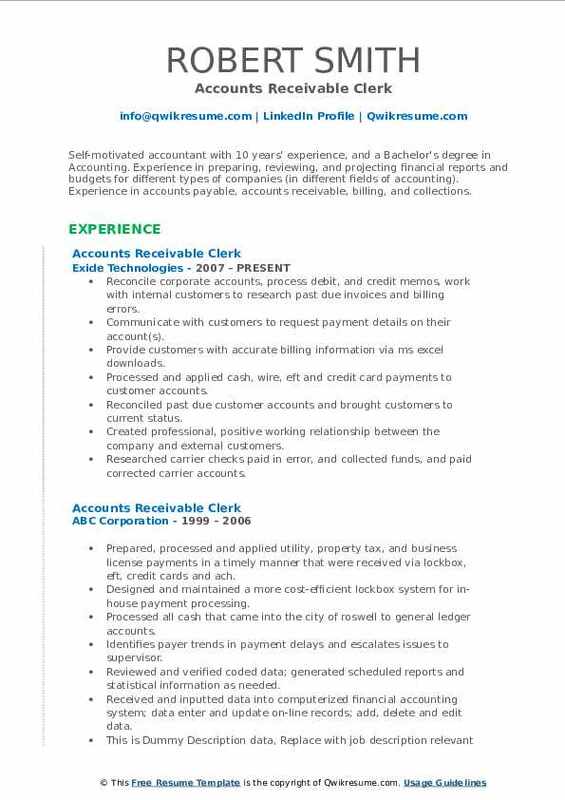 Major tasks that are showcased on the Accounts Receivable Clerk Resume include these – maintaining billing system, generating invoices and account statements, maintaining accounts receivable files and records; assisting in general financial analysis and management, performing day-to-day financial transactions, facilitating payment of invoices, and reconciling accounts receivable ledgers. 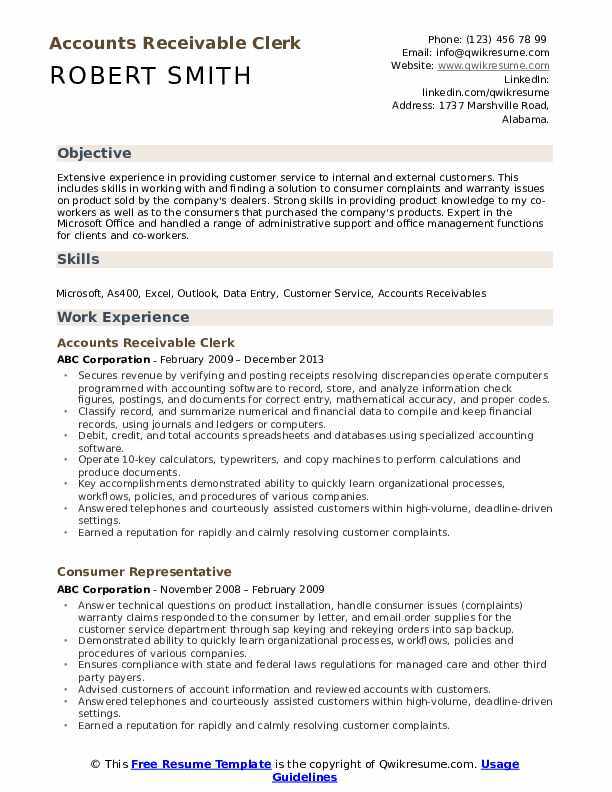 For this role, employers want those possessing these skills – solid understanding of basic accounting principles, data entry skills, hands-on experience in operating spreadsheets, proficiency in accounting software, a knack for numbers, and knowledge of fair credit practices and collection regulations. Having a degree in accounting or finance will allow candidates to secure this job. Summary : Extensive experience in providing customer service to internal and external customers. This includes skills in working with and finding a solution to consumer complaints and warranty issues on product sold by the company's dealers. Strong skills in providing product knowledge to my co-workers as well as to the consumers that purchased the company's products. Expert in the Microsoft Office and handled a range of administrative support and office management functions for clients and co-workers. Secures revenue by verifying and posting receipts resolving discrepancies operate computers programmed with accounting software to record, store, and analyze information check figures, postings, and documents for correct entry, mathematical accuracy, and proper codes. Classify record, and summarize numerical and financial data to compile and keep financial records, using journals and ledgers or computers. Debit, credit, and total accounts spreadsheets and databases using specialized accounting software. Key accomplishments: demonstrated ability to quickly learn organizational processes, workflows, policies, and procedures of various companies. Answered telephones and courteously assisted customers within high-volume, deadline-driven settings. Earned a reputation for rapidly and calmly resolving customer complaints. Position held: administrative assistant responsibilities: answering incoming calls, making and canceling appointments, ordering supplies, opening daily mail reconciling monthly bank statements for replacement reserve, tax and insurance, and security deposit for each of our 28 properties we manage. Filing, checking the fax machine and sorting the faxes by the person, matching up payable invoices twice a month to checks that will be going out. Typing corresponded for the company to USDA, vhda, Boston capital, and others. Summary : To obtain a long term position with a company that has stable growth, advancement and management possibilities with a professional team and good environment. Maintained accuracy in calculating daily harvesting, sale reports, and packaging price list. Created daily and weekly harvest reports and planting schedule for management. Greet numerous visitors, vendors, new applicants and interview candidates. Enter financial data from sales reports with revenues and charges into the company accounting database to be verified, balanced and reconciled. Updated customer master files and maintained individual customer account records. Managed all accounts receivable accounts, post payments, daily/monthly reports, call on delinquent accounts. 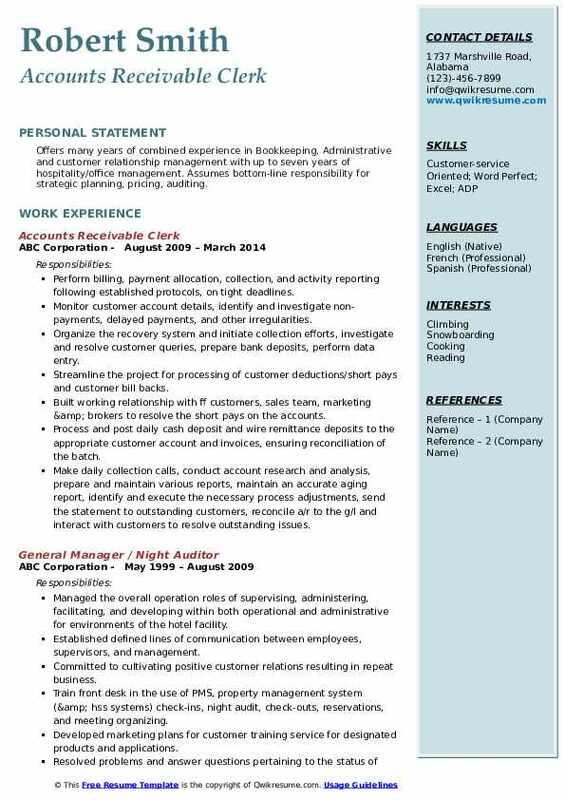 Summary : Self-motivated accountant with 10 years' experience, and a Bachelor's degree in Accounting. Experience in preparing, reviewing, and projecting financial reports and budgets for different types of companies (in different fields of accounting). 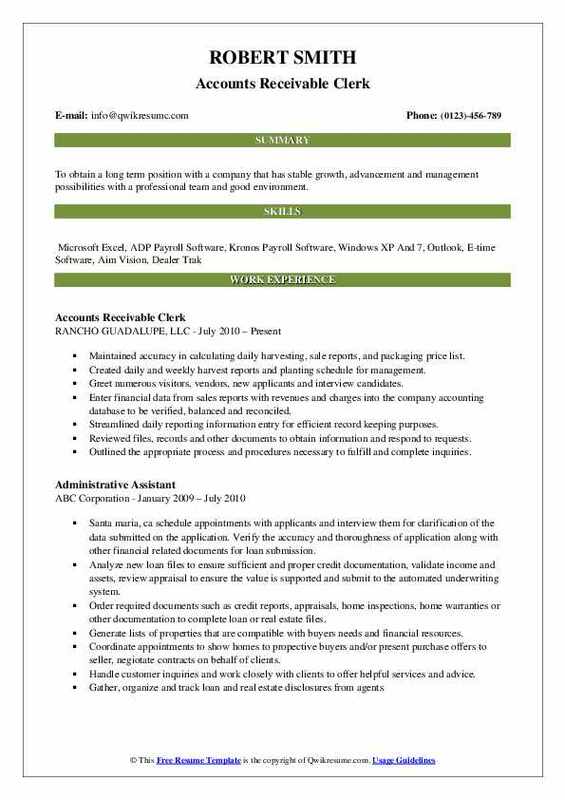 Experience in accounts payable, accounts receivable, billing, and collections. Skills : Expert knowledge of Microsoft Word and Excel Experience using accounting software such as Quick Books Pro, Lotus 123 Peachtree. Reconcile corporate accounts, process debit, and credit memos, work with internal customers to research past due invoices and billing errors. Communicate with customers to request payment details on their account(s). Provide customers with accurate billing information via ms excel downloads. Processed and applied cash, wire, eft and credit card payments to customer accounts. Reconciled past due customer accounts and brought customers to current status. Created professional, positive working relationship between the company and external customers. Researched carrier checks paid in error, and collected funds, and paid corrected carrier accounts. 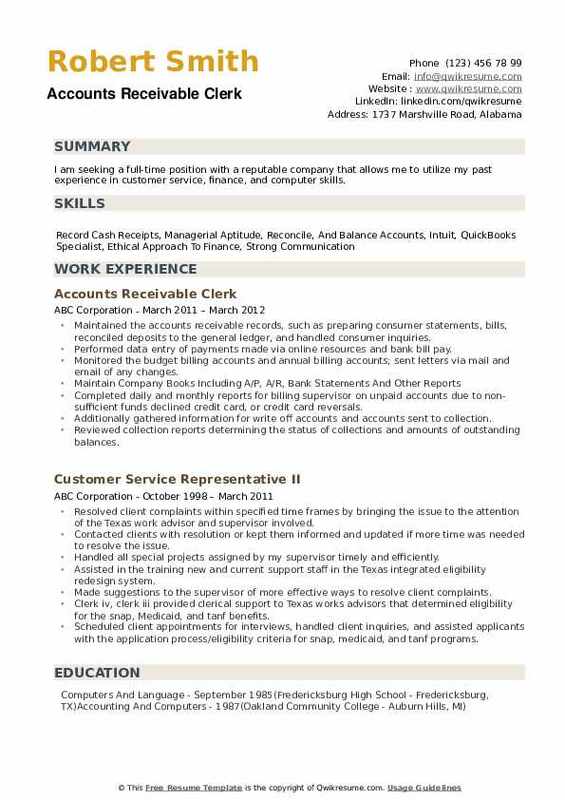 Worked as accounts receivable clerk researching payments and misapplied funds. Conducts collection activity on previously appealed claims by contacting government agencies, third party payers via phone, email, or online. Ensures compliance with state and federal laws regulations for managed care and other third-party payers. Summary : Offers many years of combined experience in Bookkeeping, Administrative and customer relationship management with up to seven years of hospitality/office management. Assumes bottom-line responsibility for strategic planning, pricing, auditing. Perform billing, payment allocation, collection, and activity reporting following established protocols, on tight deadlines. Monitor customer account details, identify and investigate non-payments, delayed payments, and other irregularities. Organize the recovery system and initiate collection efforts, investigate and resolve customer queries, prepare bank deposits, perform data entry. Streamline the project for processing of customer deductions/short pays and customer bill backs. Built working relationship with ff customers, sales team, marketing & brokers to resolve the short pays on the accounts. Process and post daily cash deposit and wire remittance deposits to the appropriate customer account and invoices, ensuring reconciliation of the batch. Make daily collection calls, conduct account research and analysis, prepare and maintain various reports, maintain an accurate aging report, identify and execute the necessary process adjustments, send the statement to outstanding customers, reconcile a/r to the g/l and interact with customers to resolve outstanding issues. Provides ongoing appropriate collection activity on appeals until the payer has responded to the appeal. Maintain record and files of direct bill accounts invoices, billings, credits updated and organized. Monitor and investigate charge and payment discrepancies for all transactions registered in the hotel computer system. Review postings and transactions that are done with direct billing accounts and reconciliation of all authorized and nonauthorized accounts deduction and charges. Provide customer service to the guest by attending inquiries regarding regular billing statements and serve as an intermediary to guest claims and resolutions. Monitor, investigate and reply to credit card chargeback's received and keep records and files updated. Make collection efforts in a consistent and courteous manner in order to maximize monthly revenue for the company and keep good business. Recognizes potential delays with payers such and make corrective actions to avoid A/R aging. Identifies payer trends in payment delays and escalates issues to supervisor. Headline : Administrative professional offering versatile skills and proficiency in accounting and human resources; strong planner who readily adapts to change, works independently and exceeds expectations. Possess the ability to juggle multiple responsibilities and meet tight deadlines without compromising quality. Located customers using credit bureaus, background checks, loan documents, purchase orders, and other paper documents. Reviewed terms of sale on loan documents, contracts, and purchase orders. Data entry of customer information: addresses, phone numbers, contacts, net terms, credit limits. Received, recorded and posted all daily deposits to the corresponding accounts. Assisted the credit analysts with reconciling accounts and ensuring not to exceed credit limits. Provided support to the staff accountants to include the monthly bad debt analysis. Assists with special projects by utilizing excel spreadsheets, and must be able to communicate results. Processed payments via ACH, as well as credit card payments and reversing credit card payment, communicate with customers through verbal and written correspondence. Continues collection activity until the account is resolved, sent to legal, or disputed. 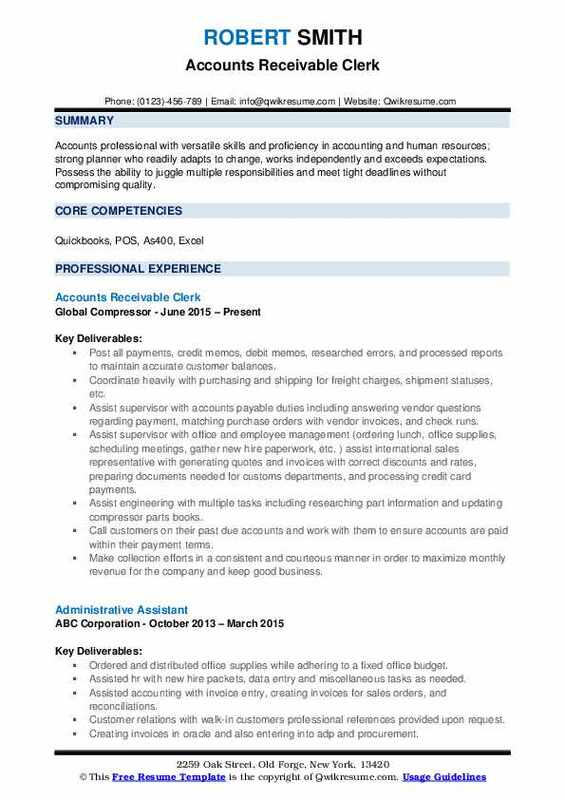 Objective : Accounts Receivable and Customer Service skills that I portray will exemplify a variety of professional experience with your organization. I have a wide variety of software applications including Microsoft Office. Created several spreadsheets for daily, weekly and monthly distribution to company executives pertaining to the accounts receivable department. Managed the issuance of duplicate titles for recreational vehicles sold. Ensured that all legal documents had been properly signed by all parties required. Ordered and issued duplicate titles after all aspects of the company policy have been met. Assisted credit manager with processing legal buybacks of recreational vehicles from dealerships. Researched possible credits owed to dealerships or banks and processed check through accounts payable according to company procedure. Reviews contracts and identify billing or coding issues and request re-bills, secondary billing, or corrected bills as needed. Conducts appropriate account activity on final billed claims by contacting government agencies, third-party payers, and patients/guarantors via phone, e-mail, or online. Resolved problems and answer questions pertaining to the status of accounts, the credit/debit of financial transactions, etc. Summary : Skilled and personable Accounts Receivable Clerk with 10+ year's experience providing consistent, approachable customer service and a full range of general office support. Advised customers of account information and reviewed accounts with customers. Verify validity of account discrepancies by obtaining and investigating information from sales, trade promotions, customer service departments and from customers. 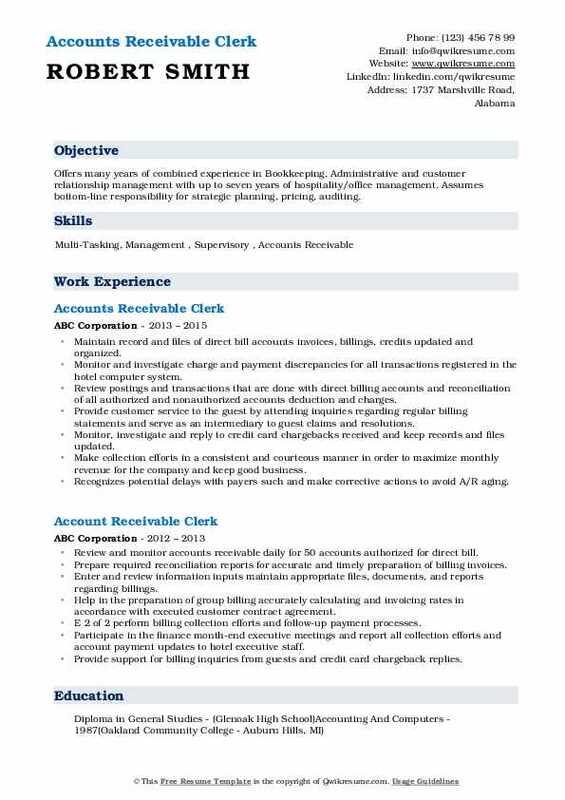 Assist account manager on month, year end, and all aspect of audit, federal, state reconciliation reporting and response to any recommendation. 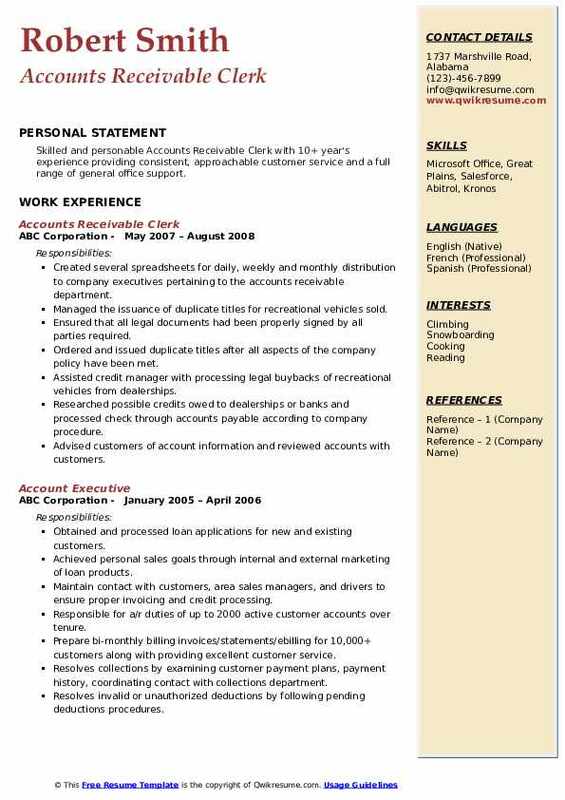 Summary : I am seeking a full-time position with a reputable company that allows me to utilize my past experience in customer service, finance, and computer skills. Maintained the accounts receivable records, such as preparing consumer statements, bills, reconciled deposits to the general ledger, and handled consumer inquiries. Performed data entry of payments made via online resources and bank bill pay. Monitored the budget billing accounts and annual billing accounts; sent letters via mail and email of any changes. Completed daily and monthly reports for billing supervisor on unpaid accounts due to non-sufficient funds declined credit card, or credit card reversals. Additionally gathered information for write off accounts and accounts sent to collection. Reviewed collection reports determining the status of collections and amounts of outstanding balances. Maintain reports in Oracle for account reconciliation using quick books. Headline : To find employment with an organization who will provide me with potential for advancement while allowing me to provide them with my high energy enthusiasm and willingness to learn any skills or abilities beneficial to their success. 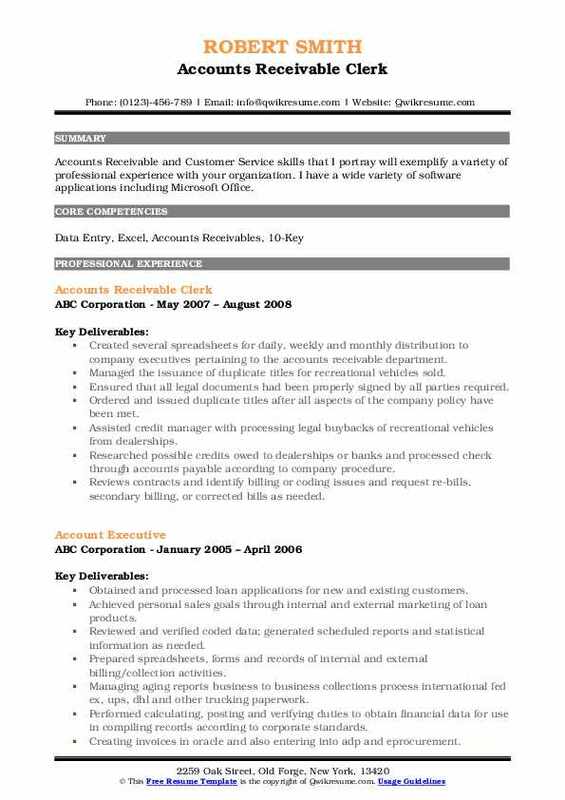 To be able to utilize my years of experience in accounting, sales, customer service and online marketing to the mutual benefit of an organization or office. Responsibilities include daily general office duties including filing, data entry, responding to phone and email communications. Processing invoices and correcting cost and freight mistakes with vendors for three manufacturing plants and forty-seven seven stores in thirty-eight states. Processing and coding monthly employee expense report for over one hundred employees. Researching and maintaining tax rules and accrual for thirty-eight states to ensure proper tax collection and payment. Ancillary duties include managing postage and shipping for the corporate office including packaging with daily runs to multiple providers and daily bank deposits. Made collection calls to customers where calls were allowed otherwise sent email letters for collections. Gathered materials to research penalties and short pays for various reasons using invoices, purchase orders & proofs of deliveries. Perform customer service and collection activities, serve as the first level representative in handling account resolution, with a focus on the resolution of all account balances. Headline : Accounts professional with versatile skills and proficiency in accounting and human resources; strong planner who readily adapts to change, works independently and exceeds expectations. Possess the ability to juggle multiple responsibilities and meet tight deadlines without compromising quality. Post all payments, credit memos, debit memos, researched errors, and processed reports to maintain accurate customer balances. Coordinate heavily with purchasing and shipping for freight charges, shipment statuses, etc. Assist supervisor with accounts payable duties including answering vendor questions regarding payment, matching purchase orders with vendor invoices, and check runs. 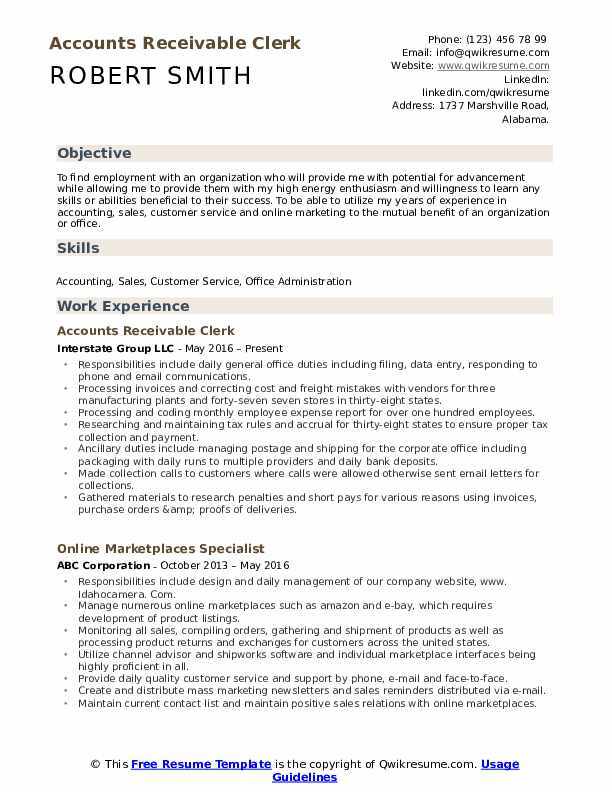 Assist supervisor with office and employee management (ordering lunch, office supplies, scheduling meetings, gather new hire paperwork, etc. ) assist international sales representative with generating quotes and invoices with correct discounts and rates, preparing documents needed for customs departments, and processing credit card payments. Assist engineering with multiple tasks including researching part information and updating compressor parts books. Call customers on their past due accounts and work with them to ensure accounts are paid within their payment terms.